Is eating ketogenic safe for a pregnant woman? Whether I would continue to eat high-fat, low-carb, ketogenic if I got pregnant tomorrow. There’s a lot of misinformation on the interwebs about whether a high-fat eating style is safe for pregnancy. 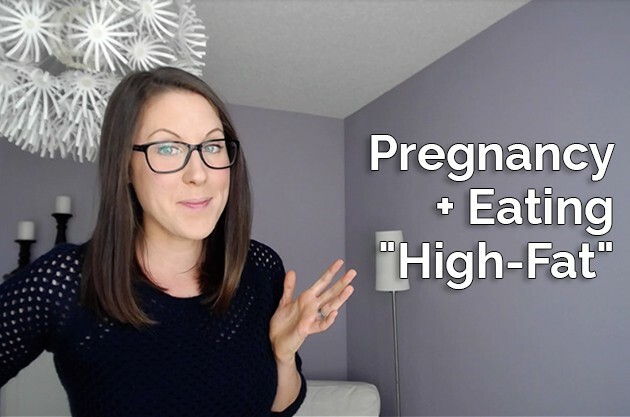 Today, I’m sharing whether I would continue to eat high-fat, low-carb, ketogenic if I got pregnant tomorrow. 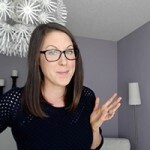 I bust through some keto pregnancy myths, breakdown the ketogenic eating style that may respond best for pregnant ladies and share how to reduce water retention and all around puffiness throughout your pregnancy. A must-watch if you’re eating high-fat, or interested in eating high-fat, and plan to be pregnant at some point in your life. First off, I can’t tell you what to do specifically but what I can do is share what I would do if I were in your position. Preparing for this topic today because I get this question all the time from many of you asking whether or not eating high fat or more ketogenic, low carb is safe for pregnancy, I started researching a little bit to kind of get a feel. I already knew what my opinion would be but I wanted to get a feel for what was out there and it was insane to see that there are resources out there that say that ketosis isn’t safe for a growing baby because it is an acidic state. That in and of itself tells me that the individuals writing those articles are a little bit confused on what nutritional ketosis is and the difference between nutritional ketosis and ketoacidosis. Ketoacidosis is a severely extreme mega-dangerous state that diabetics get into usually brought on by skipping their insulin or not taking the proper amount of insulin. Unlike nutritional ketosis, ketoacidosis is accompanied by unnaturally high levels of ketones. We’re not talking about the nutritional ketosis state of like 0.5 to 3. We’re talking like double digit craziness. Along with increased blood sugar levels, about three times the normal level. When you’re looking at research or articles specific to keto and pregnancy, it is good to look for keywords such as “high acidic state” or “unnaturally high ketone levels”. Potentially dangerous situation that causes our blood to be acidic, blah, blah, blah. If you see those sorts of keywords, it’s probably fair to assume that the people that have written those articles maybe have nutritional ketosis and ketoacidosis confused. I am going to share seven points on why if I were pregnant, I would continue to eat fat fuel, low carb, high fat throughout my pregnancy. Point number one, did you know that when you are pregnant, you dip into a state of ketosis almost every night when you sleep? Crazy, right? Usually this accompanies a 12 to 18 hour fast for pregnant women. If your dinner was at 6pm and then you go to bed at 8pm and you sleep until 8am, that’s a 14 hour fast. Maybe you don’t eat until 10 when you get to work and so oftentimes pregnant women will jump into ketosis a lot faster than non-pregnant women. The first point is, if a pregnant woman’s body gets into ketosis quite easily, how can it be unsafe? Point number two, nutritional ketosis is accompanied by a moderate amount of ketones, regulated blood sugar, and way, way, way, way lower than what you would ever experience in keotacidosis. If a woman experiences ketosis and nutritional ketosis while pregnant, it is a fraction of what they would experience in ketoacidosis. First you’d have to be a diabetic and mess up with your insulin and all the things. Point number three. The little baby growing inside of you requires about 30% ketones in order to develop. The little fetus uses ketones to synthesize needed fats for growth. Ketones are a little bit required which is probably why a pregnant woman’s body will go into ketosis while she sleeps to provide the baby with some of those ketones. We know right off the bat that it’s not dangerous for the baby. Number four, and this is a big one, I know that my body enjoys being in a slight state of ketosis. I know that my body enjoys eating this way. It is the best I have ever felt so the fact that I feel good eating this way tells me that if I am growing a baby inside of me, I’ll probably want to still feel good. If I’m not feeling good then I’m going to switch things up so I can feel good. Point number five, ketogenic and more of a fat fueled eating style, as I outline in my program, is packed with whole foods. I would have a really hard time switching to something else because I know that the whole food eating style that I’m eating is probably so much better than I could do instead. Number six, the brain is made up of over 60% fat so the little baby growing inside of you is probably going to need some fat to make some awesome things and do and grow and be and create a beautiful brain so having a lot of fat in the eating style that you’re following while you are pregnant is pretty important. Point number seven, and this is so in line with exactly what I’m experiencing, I had amenorrhea for eight years so my body was not prepared to have a baby. When I started eating this way, after a year, I got my period back. That tells me that when we’re using a low carb, high fat, more fat fueled eating style to gain fertility, our body feels safe enough to have a baby. Our bodies wouldn’t be fertile in a space where it’s too uncomfortable to have a baby. The fact that I’ve been in ketosis for over a year and a half and got my period tells me that my body feels like it’s safe for the first time in eight years to actually carry a child. If I were to get pregnant tomorrow, here are five things that I would do to slightly adjust my eating style to nurture the baby that’s growing inside of me and I do a lot of this already. In fact, I think I do almost all of the things. This information might be helpful for you if you’re following more of a strict ketogenic eating style or classic keto and you’re not following my program in Fat Fueled. Number one, I would eat until I’m full. I wouldn’t be restricting what I was eating. I would wake up when I’m hungry, I would eat. I wouldn’t go to bed hungry. I would really, really listen to my body. Number two, I would stop all intermittent fasting. Number three, this ties in a little bit to number two, I would switch my rocket fuel latte or bullet proof coffee or fatty drink for something a little bit smaller and have a breakfast with it just to a look at a case of nutrients and making sure I’m having enough nutrients in my day to make sure that my baby is growing perfectly. Number four, I would likely carb up every night or at least any time that I felt like I needed to carb up. The baby that is growing inside of you needs a combination of the ketones, obviously because our bodies naturally go into that state while we’re pregnant, as well as glucose. I would look at managing things by having to carb up every night or every second night depending on my body. If you have a copy of my program, Fat Fueled, that would be the daily fat burner, fat fuel profile. Number five, I would focus on nutrient dense fat. These are things like avocado. I feel like there was no mistake that the avocado looks like a pregnant woman’s belly. It has all the nutrients, vitamins, minerals that you need when you’re pregnant so I would load up on avocado. Also, coconut so coconut oil, coconut butter, all the coconut things. I also have clients that had a lot of success with beef tallow while they’re pregnant. Also as a side tip, I had a girlfriend that was pregnant a couple of months ago and she experienced crazy swelling all over. After tweaking things a little bit, we noticed that she was quite sensitive to carbohydrates and every time she had a bunch of carbohydrates in a day, she would get really, really swollen that night or the next morning. Research from Michael D. Fox suggests that pregnant women are quite sensitive to carbohydrates so by reducing our amount of carbohydrates, we might not get swollen as much and be able to go about our day without the Frodo feet is what we call them because they were so big and swollen. I hope that was helpful to you and that you could pick apart little things that would help you on your path. I very much encourage you to listen to your body. In my case, I’ve been eating this way for a year and a half so if I were to get pregnant, I would just continue eating this way because I know it works well for me. If you’re currently pregnant, maybe adding in some fats here and there really good but I wouldn’t massively switch up your eating style while you’re pregnant. You just want to stay the course and make healthy choices for yourself and really, really listen to your body. If what I shared today resonates with you and you’re like, “Woah! What’s all this high fat stuff about? I want to learn about using fats to heal my body,” you can grab my program, Fat Fueled. I’ve linked to it up here and you can click on over there and check out Fat Fueled and see if it’s right for you. If you want to hear from me every Wednesday on all things fat and healthy living and maybe some more pregnant stuff if you want it, then subscribe to my channel. Also link over here. You can go ahead and subscribe. Also below, if you’re watching this on my blog and I will see you next Wednesday. Bye.